This article shows you the way to convert .dvdmedia files to MP4 on Mac OS X (EI Capitan & Yosemite included) so that you can play .dvdmedia files more conveniently. Maybe some of you are not so familiar with .dvdmedia file. Actually, it’s just a bundled package file on Mac with .dvdmedia extension, containing all DVD video and audio files, like a VIDEO_TS folder in Windows computer. Mac DVD Player can directly play it on Mac. The biggest merit of .dvdmedia file is that you can enjoy the video by simply double clicking the file rather than dragging a whole VIDEO_TS folder to DVD Player. However, if you want to play .dvdmedia files on portable media players like iPhone, iPad, Android tablets, etc., you will need to convert .dvdmedia to MP4 on Mac first. To convert .dvdmedia files to MP4 on Mac OS X (including EI Capitan and Yosemite), you need the help of a Mac .dvdmedia converter. Here Brorsoft DVD Ripper for Mac (Reviews) is highly recommended to help you get the job done. With it, you can convert .dvdmedia to any popular video format like MP4, MOV, MKV, FLV, AVI, WMV, etc. with fast encoding speed and zero quality loss. Besides, the Mac dvdmedia to MP4 converter provides many optimized presets for iPad, iPhone, Apple TV, Samsung Galaxy devices, Xbox One, Xbox 360 and more. Launch DVD Ripper for Mac and load .dvdmedia. You need to change a .dvdmedia file to a VIDEO_TS folder at first and then load the whole DVD folder. Click “Format” to find “HD Video” catalogue, select “MPEG-4 HD Video (*.mp4)” or “H.264 HD Video(*.mp4)” as the output format. If you want to play the output video files on iPhone, iPad, iPod, etc., you can just choose the corresponding device as the output format to generate videos with optimized settings for a certain device. 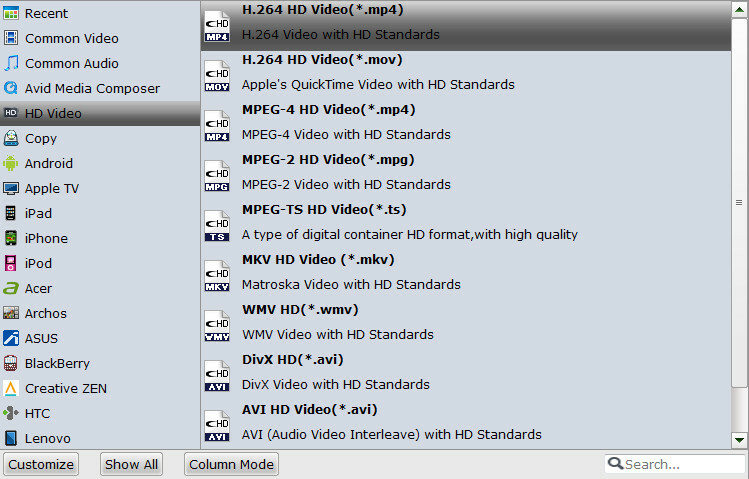 When all the settings are done, click “Convert” on the main interface to begin converting DVD .dvdmedia to MP4 on Mac. When the conversion finishes, this app will pop up a message informing you of the success. 1. Directly Copy will help to backup the 100% intact DVD main movie. 2. Full Disc Copy can 1:1 backup the entire DVD with original structure and chapter markers. How to change a .dvdmedia file from/to a VIDEO_TS folder easily and vice versa. 1. Right click the .dvdmedia file, and choose Get Info. 2. Delete the suffix .dvdmedia in the Name & Extension field, and click Return. 3. Click Confirm in the window that shows up. 4. The .dvdmedia file has changed a VIDEO_TS folder. Then you can start the program, and go to File > Load DVD feature to import the DVD folder. 2. Enter the suffix .dvdmedia in the Name & Extension field, and click Return. 3. Click Confirm in the window that opens. 4. The VIDEO_TS folder has change to a .dvdmedia file.